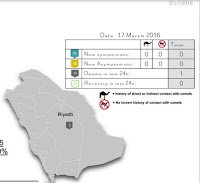 Over the past 14 reporting days Saudi Arabia has reported 39 new MERS cases, and at least 16 deaths, many centered around a hospital outbreak in Buraidah, the capital city of Al-Qassim. 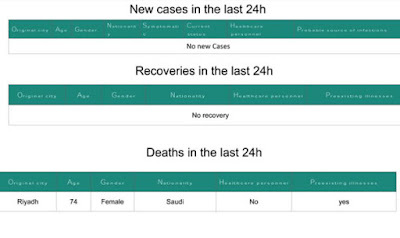 Today, for the first time in more than two weeks, we have no new cases announced. We'll need to see a string of such days before we know if this lull indicates the Buraidah outbreak has been contained. One death, that of a 74 y.o. woman in Riyadh (announced as a `Primary case' on the 12th), is reported.